Building on the CNN Skill made available to Amazon Echo, Amazon Tap and Echo Dot owners in 2016, CNN has expanded its offerings on Amazon platforms to include daily ‘Flash Briefings’ and programming for the new Amazon Echo Show product. CNN will also update its daily flash briefing to include a morning video Flash Briefing, hosted by CNN’s New Day anchors, Chris Cuomo and Alisyn Camerota. Audio from this content will also be available across all Amazon Echo devices in the CNN Flash Briefing skill, as well as other platforms like Google Home and iTunes. This update to the CNN Flash Briefing will take advantage of the new video capabilities of the Amazon Show, and refine past updates that replaced a text-to-speech experience with a more curated, twice daily audio program. 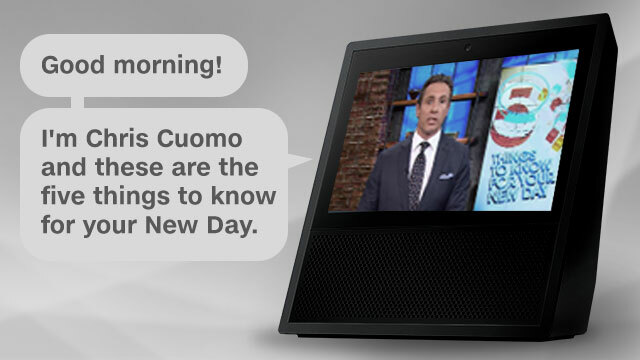 To find the CNN Flash Briefing, enable the “CNN Flash Briefing” skill and move it to the top of your flash briefing list in the Settings section of the Amazon Alexa app. CNN is also adding a new voice to audio news with CNN Politics Reporter and Editor-at-Large, Chris Cillizza. Cillizza will anchor a new audio politics briefing, delivered in five minutes or less, every weekday starting at 7pm ET. “The Point with Chris Cillizza” will be available everywhere you listen to podcasts and through Amazon Echo Flash Briefings and Google Home news briefings. CNN was the first publisher to deliver topic-based TV coverage in near-real time on Amazon Echo, Amazon Tap, and Echo Dot. With this expansion, CNN’s audio offerings now include a custom CNN skill on Amazon Alexa, CNN action on Google Home, two separate daily news briefings via Amazon Alexa’s Flash Briefing and Google Home’s Narrated News, alongside podcasts available on both platforms through TuneIn.